The cost per first stream is a metric used by Amazon to assess how much it cost to the company to hook a customer on their video platform, Prime Video. That is given by the show’s production and marketing expenses divided up to the number of people who stream that program after signing up. The lower the cost the better. According to Amazon‘s internal documents disclosed by Reuters, a few interesting things came out about how Amazon is using its streaming subscription platform – Prime Video – as a way to add value to the overall Amazon business model. With a more in-depth look, you realize that is not the case. However, when we look at things we like to believe that they were planned. Yet Amazon‘s business model is fascinating for the opposite reason. In some way, some of the businesses had started as a necessity of the company to scale up. One example is the incredible story of how Amazon developed AWS, as a pure necessity to allow stores to build e-commerce on top of Amazon‘s engine. What was initially a side business; it had become a significant contributor to Amazon’s success. Other times, however, when a company unlocks financial resources, not available in the past. This allows that company to start “designing” its business model. 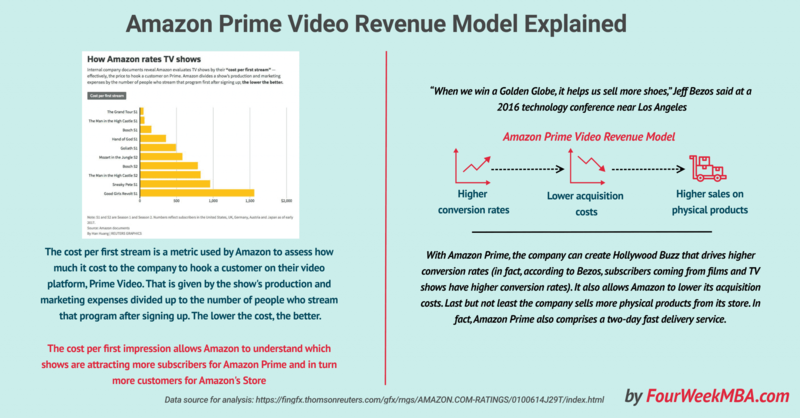 That is the case of how Amazon is using the streaming platform Prime Video, to attract subscribers, retain them and most importantly convert them into Amazon‘s products buyers. Amazon Prime is a subscription service offered by Amazon. It comprises a two-day fast delivery service for products purchased through Amazon and a streaming platform where a user can access videos and music, just like on Netflix. You might wonder, what buying a physical product on an online store has to do with a subscription to a service that offers video streaming? At a 2016 technology conference near Los Angeles, referring to film and TV customers Jeff Bezos said: “they convert from free trials at higher rates” compared to users that do not stream videos on Prime. For example, the first season of the popular drama “The Man in the High Castle,” an alternate history depicting Germany as the victor of World War Two, had 8 million U.S. viewers as of early 2017, according to the documents. The program cost $72 million in production and marketing and attracted 1.15 million new subscribers worldwide based on Amazon’s accounting, the documents showed. Another advantage Amazon gets from Prime Videos is based on its acquisition costs. In fact, Amazon calculated that the show“The Man in the High Castle,” drew new Prime members at an average cost of $63 per subscriber. Considering that Amazon‘s Prime subscriptions come at $99 on a yearly basis that seems a scalable way for Amazon to acquire new customers as quickly as possible. True, not all shows will be as successful yet when new Prime members come in there is also another related vantage for Amazon. In other words, Prime Video is a great way to attract new customers to Amazon‘s store. As Jeff Bezos pointed out, entertainment is quite effective in driving merchandise sales. Imagine for a second you have a store. That store has on average ten customers each day. Yet one day the number goes to twenty. What had happened? Apparently, ten customers rushed in to buy the new product you had in store. Thus, you monetized thanks to that new product. Going back to Amazon Prime, the cost per the first impression allows it to see what shows are driving up subscriptions. In fact, when Amazon had launched “The Gran Tour Season One” its cost per the first impression was $49. In other words, new Amazon Prime subscribers watched “The Grand Tour” as soon as they joined in. Further allowing Amazon to improve its customers’ base. This metric allows Amazon Prime to understand which shows are driving more new subscribers in. Thus, what shows are generating more value for Amazon. Most of the times a business model is the result of tinkering. When financial resources not available in the past are unlocked; some elements might be intelligently designed to improve the overall value of that the organization. This strategy has proven quite powerful.